BEAUTIFUL MCCOY PLANTER FROM THE DIFFICULT TO FIND LILY BUD LINE OF 1941! 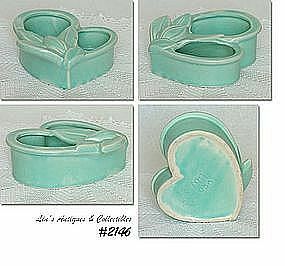 BECAUSE OF ITS SHAPE, THIS ONE IS CALLED THE "HEART" PLANTING DISH AND IS PASTEL AQUA COLOR WITH SEMI-MATTE GLAZE. MARKED ON BOTTOM WITH OVERLAPPING NM AND USA. WONDERFUL CONDITION -- HAS A COUPLE SLIGHTLY DARKENED CRAZE MARKS ON BOTTOM, A 1/16" DOT SIZE DING ON RIM, AND AN OLD, SUPERTIGHT 1/2" HAIRLINE AT ONE LEAF--OF NO CONSEQUENCE! THIS IS A VERY DIFFICULT TO FIND ITEM AND IS IN EXCEPTIONAL CONDITION FOR ITS AGE! HAS ALWAYS BEEN PAMPERED AND APPEARS TO HAVE NEVER BEEN USED AS A PLANTER. SUPER!